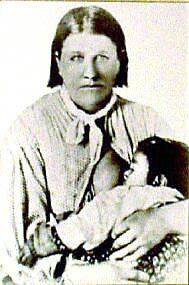 Cynthia Ann Parker (ca. 1825-ca. 1871), a captive of the Comanches, was born to Lucy (Duty) and Silas M. Parker in Crawford County, Illinois. According to the 1870 census of Anderson County she would have been born between June 2, 1824, and May 31, 1825. When she was nine or ten her family moved to Central Texas and built Fort Parker on the headwaters of the Navasota River in what is now Limestone County. The family developed a community around the church of her uncle, Elder John Parker, who headed the Texas branch of the Primitive Baptist Church. As protection against the Natives of the area, they built substantial walls around their community and created a company of Texas Rangers for the area. The settlement became known as Fort Parker. On May 19, 1836, Fort Parker was attacked by several hundred Caddo, Comanche and Kiowa. They killed several of its inhabitants. During the raid the Comanches seized five captives, including Cynthia Ann. Within 6 years, all the captives had been returned to their white families, except Cynthia Ann who remained with the Indians for almost twenty-five years, forgot white ways, and became thoroughly Comanche. Although she was beaten and abused at first, she was soon integrated into the tribe. Cynthia was given to a Tenowish Comanche couple who cared for her, and who raised her like their own daughter. She became Comanche in every sense; was trained in Native ways and was totally devoted to her adopted parents. The memories of her white life quickly faded, and every attempt to ransom her was refused by the tribal council at her request. It is said that in the mid-1840s her brother, John Parker, who had been captured with her, asked her to return to their white family, but she refused, explaining that she loved her husband and children too much to leave them. She is also said to have rejected Indian trader Victor Rose's invitation to accompany him back to white settlements a few years later, though the story of the invitation may be apocryphal. A newspaper account of April 29, 1846, describes an encounter of Col. Leonard G. Williams's trading party with Cynthia Ann, who was camped with Comanches on the Canadian River. Despite Williams's ransom offers, tribal elders refused to release her. Later, federal officials P. M. Butler and M. G. Lewis encountered Cynthia Ann with the Yamparika Comanches on the Washita River; by then she was a full-fledged member of the tribe and married to a Comanche warrior. She never voluntarily returned to white society. Indian agent Robert S. Neighbors learned, probably in 1848, that she was among the Tenawa Comanches. He was told by other Comanches that only force would induce her captors to release her. She married Peta Nocoma, the young chief who gained fame for his many violent raids on white settlements in the territory. While it was customary for prominent Comanche warriors to take several wives, Peta never took any wife except Cynthia ann - a mark of extraordinary devotion and honor for her. They had 3 children: Quanah, Pecos and Topsannah (2 boys and 1 girl). On December 18, 1860, Texas Rangers under Lawrence Sullivan Ross attacked a Peta's hunting camp at Mule Creek, a tributary of the Pease River. During this raid the rangers captured three of the supposed Indians. Peta was wounded, but managed to escape with their two sons, Quanah and Pecos. The Rangers were surprised to find that one of the Commanche had blue eyes; it was a non English speaking white woman with her infant daughter. Col. Isaac Parker later identified her as his niece, Cynthia Ann. Cynthia accompanied her uncle to Birdville on the condition that military interpreter Horace P. Jones would send along her sons if they were found. While traveling through Fort Worth she was photographed with her daughter at her breast and her hair cut short - a Comanche sign of mourning. She thought that Peta Nocona was dead and feared that she would never see her sons again. On April 8, 1861, a sympathetic Texas legislature voted her a grant of $100 annually for five years and a league of land and appointed Isaac D. and Benjamin F. Parker her guardians. But she was never reconciled to living in white society and made several unsuccessful attempts to flee to her Comanche family. After three months at Birdville, her brother Silas took her to his Van Zandt County home. She afterward moved to her sister's place near the boundary of Anderson and Henderson counties. Cynthia Ann's every attempt to return to her people failed, and she was repeatedly caught and returned. Even though she refused to speak of her Comanche life, many fanciful and fictitious stories were written about this strange and mysterious woman. "Historical fiction" was used to incite anti-Indian feelings, and these tall tales eventually became accepted as truth and fact. Never satisfied, and never at home in a society that was foreign to her, Cynthia was shuttled from one family member to another. Her grief and longing for her lost family never left her. She never adjusted to white life and was often locked in her room to keep her from running away. In 1863, Cynthia received word that her son Pecos had died of smallpox, and only a few months later, the her daughter died of influenza. Topsannah's death from fever in 1863 was the final blow for Cynthia Ann. Often refusing to speak or eat, she died in 1870 of influenza at the age of 43. At her death she was buried in Fosterville Cemetery in Anderson County. In 1910 her son Quanah moved her body to the Post Oak Cemetery near Cache, Oklahoma. She was later moved to Fort Sill, Oklahoma, and reinterred beside Quanah. In the last years of Cynthia Ann's life she never saw her Indian family, the only family she really knew. But she was a true pioneer of the American West, whose legacy was carried on by her son Quanah. Serving as a link between whites and Comanches, Quanah Parker became the most influential Comanche leader of the reservation era. BIBLIOGRAPHY: James T. DeShields, Cynthia Ann Parker: The Story of Her Capture (St. Louis, 1886; rpts. : The Garland Library of Narratives of North American Indian Captivities, Vol. 95, New York: Garland, 1976; Dallas: Chama Press, 1991). Margaret S. Hacker, Cynthia Ann Parker: The Life and the Legend (El Paso: Texas Western Press, 1990). Grace Jackson, Cynthia Ann Parker (San Antonio: Naylor, 1959). Paul I. Wellman, "Cynthia Ann Parker," Chronicles of Oklahoma 12 (June 1934). Women of Texas (Waco: Texian Press, 1972). "PARKER, CYNTHIA ANN." The Handbook of Texas Online. [Accessed Wed May 8 11:37:53 US/Central 2002 ].